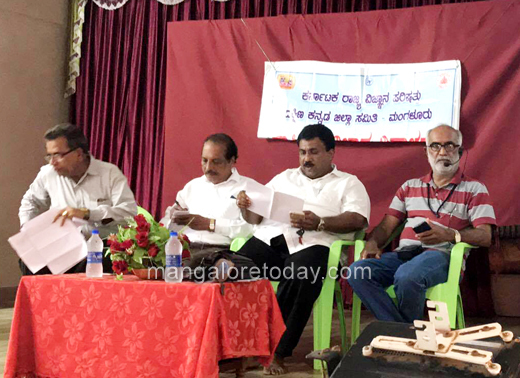 Mangaluru, Sep 9, 2017: A program on pseudoscience and its exposure was held at Sudana Residential school in Puttur, on the 8th of September under the aegis of the Dakshina Kannada branch of Karnataka Rajya Vigyana Parishat, Federation of Indian rationalist associations. 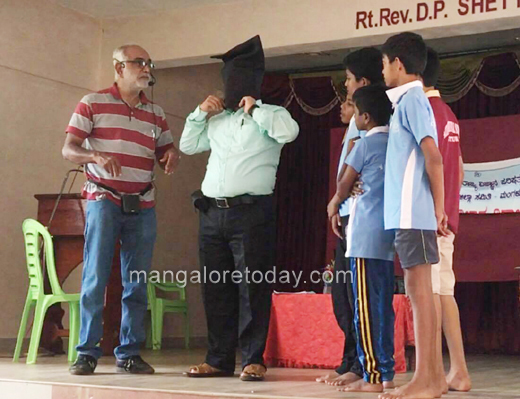 In this program the modus operandi of those propounding pseudo sciences was discussed in an attempt to educate the teachers, students and the media about such. An example of that was taken as an enterprise called Smart Brainy who had put forward pamphlets promising to make children as the greatest in the world s greatest and a super genius child! They have also promised something called as DMIT (Dermatoglyphics Multiple intelligence Test) . The whole brain development program is supposed to develop the whole brain and make the child a super genius using both sides of the brain! They had also claimed to be affiliated IBRO (International Brain Research organization) and Society for Neurosciences, both of which are bodies unknown to professionals in psychiatry and neurosciences. For all these tall claims they have only one thing to show that the children trained by them can read blind folded- if the literal meaning of the word is to be taken that would mean that without any light falling on retina which would be a major break through revolutionary discovery in the world of all sciences because the conclusion up to now is that the sensory impulses produced when the light reflected off an object has to pass the through the cornea to fall on the retina! When a claim is made that one can see without that would indeed be the discovery of the millennium. To flaunt their claims they display children with alleged blind folds who can ‘see’ through them. While we maintain that they see through the gaps, the proponents claim that they can see through the blind folds. To debunk this theory a magician Munawar Pasha performed that with a blind fold and a hood over it! He also read through a solid metal blind fold! He however is a professional magician and did not reveal his tricks because they do not do that. But, next it was the turn of the students. They were asked to come on the stage, an apparently opaque blind fold was shown to all for checking. After it was applied the children’s “brain was activated” and as soon as that was done they started seeing with the blind fold on! Later on when it was explained to them as to how it was done the audience was astonished- what was claimed to be ‘supernatural power’ was just an ordinary trick! The technique called as midbrain activation or whole brain development and supersensory development program are the same for a pseudo scientific scam. There is also an attempt to show that dermatoglyphics(finger print reading) can predict a child’s future which is again a lie. However, some in the audience tried to convince others that what we showed were tricks but what was being done at the business called as Smart brainy was a demonstration of super brain power which did not carry much weight with the audience as both the teachers were pretty convinced by their own experience that the claims were fraudulent! In the meanwhile since complaint has been lodged with deputy commissioner of DK he has ordered the DDPI to enquire into our complaint and submit a report. Such wild claims are to be properly investigated as the people putting forward them have absolutely no evidence to back them up except anecdotal testimonies of some people whose motives are suspect.